Jonathan Woodgate’s career has been utterly ruined by injury, which may be some kind of karma for his involvement in the attack on an Asian student back in 2000. Still, despite his immense talent, the 31-year-old central-half has struggled to stay fit for any decent length of time since leaving Leeds United in 2003. Stoke boss Tony Pulis took a gamble on the former Real Madrid man during the summer, bringing him to the Britannia Stadium on a pay-as-you-play deal. However, ahead of the club’s historic Europa League campaign, Pulis has decided to leave the new recruit out of his official squad for the competition. 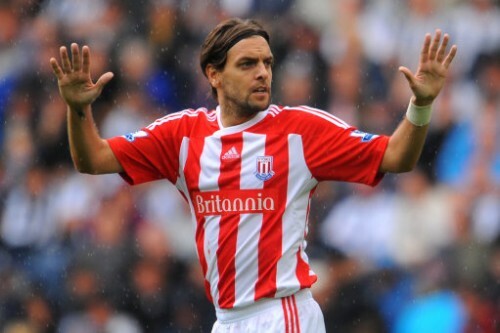 The Potters boss is apparently worried about the amount of travel that Woodgate would have to do during the Europa League (to Israel, Ukraine and Turkey), and how that might affect his fitness. The journeys may well be a little tiring, but just how weak is Woodgate if his manager thinks he’d struggle sitting on his behind on a plane for five hours? also, if a catering cart bumps his knee, his leg might fall off. They can’t afford to fly him first-class?